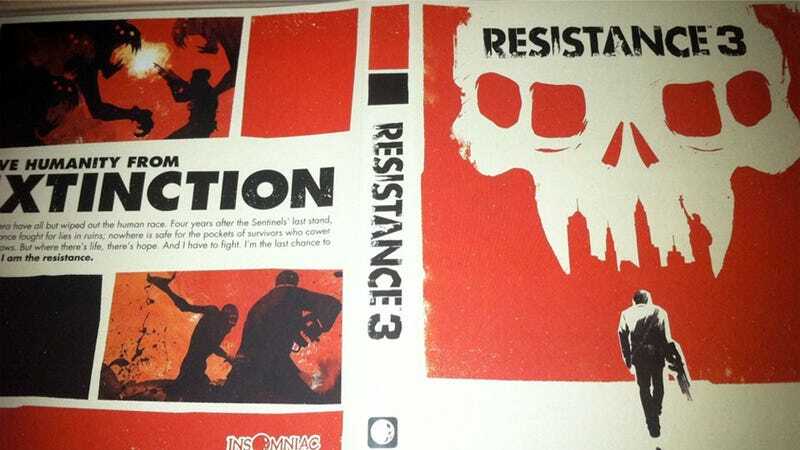 Insomniac Games' PlayStation 3 shooter Resistance 3 has some of the best, some of the classiest box art of the year, thanks to beloved British graphic designer Olly Moss. Better still? You won't have a visually wade through a sea of logos to enjoy Moss' work. In a welcome move for box art enthusiasts, Insomniac and Sony will offer a "clean/logo-free inlay/reversible cover" that lets you ignore the ESRB rating, PlayStation Move support badging and logos for the developer, publisher and PlayStation Network when viewed lovingly from your shelf. This is pure, 100% box art, front and back, without any of the filler, as seen on the dev's official Twitter. More of this, please, developers and publishers! Resistance 3 hits the PS3 in North America on September 6.